I take a day off from work to join a couple of friends for a day of diving. We start out doing a dive we have done before: The very colorful, crystal-clear, fish-filled Rainbow River drift dive. On this day, we enjoyed a 90-minute dive—letting the current of the river do much of the work as we float along for about 1.5 miles. We then eat lunch at KP Hole, a county park, and are off to a dive we had not done before—Paradise Springs, which is due east about 30 minutes from Rainbow. 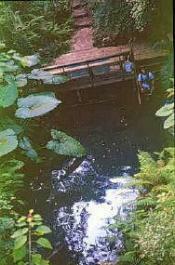 Divers are aided at the privately-owned spring by being allowed to park near the spring entrance, and gear up at a nearby gazebo, which is just a short walk to a wooden stairway that leads down to the spring mouth. The mouth is at the bottom of a 40-foot slope within a small, wooded area. The mouth is small—only 20 feet wide. The spring is quite interesting and dramatic. Near the mouth at the surface is a petrified, enormous whale bone and a large tree angled toward the surface. The walls and ceilings are covered with prehistoric artifacts—a very thick layer of large sand dollars, sea biscuits, shells, fossils, and bone fragments. The water is crystal clear (up to 200 feet of visibility) and 74 degrees year round. Descending to depth is aided by a thick, yellow plastic rope—which I spend most of my descent holding on to, as I am concerned about the threat of a sudden blackout ("zero visibility") due to the possibility of one of us kicking up sediment from the bottom, and my having no real previous experience with cave diving or overhead environments (note that this dive can be done without cave-diving certification, as long as you do not proceed beyond the "grim reaper" sign at a depth of 100 feet). Because the sink descends at an angle from the entrance at the surface, it becomes somewhat dark at depth—which requires divers to carry flashlights. While descending, we are treated to very good visibility of the large cavern rooms we pass through. The sink is mostly quite roomy with very adequate clearances, with three large rooms that one passes through at a 45-degree angle on the way to the 100-foot depth, which is the end of the road here for non-cave certified divers. At this location, we are greeted by a "grim reaper" sign that warns non-cave divers to go no further, instead of proceeding into the tunnel, which eventually leads to a 140-foot depth. One of the real treats of this dive is to occasionally look back at the surface. An eerie, ghostly light blue glow can be seen all the way down at the "grim reaper" sign. Unfortunately, I am forced to ascend soon after reaching the grim reaper room as I have started hyper-ventilating. This soon induces my first dive-related panic attack. I am terrified. Fortunately, despite this terror and discomfort, I am able to ascend slowly enough that my dive computer does not send me frantic "beep" warnings, telling me that I had an overly-rapid ascent. By avoiding the "beep," I am able to avoid decompression sickness ("The Bends"). Since I have a fair amount of air remaining in my tank at the surface, I went back for a shallow dive in the first two rooms of the sink (which are quite large), after I have calmed down. In all, my group greatly enjoyed the dive. I will probably return—and next time, I vow to dive without "incident." The next day, I am invited to a 50th birthday party for a friend. The party is held at Ginnie Springs, and since I have not dove there in the past, I brng along my gear—hoping to find a dive buddy at the park. As luck would have it, I quickly find a guy who is at the park checking out his new gear during a trip from Georgia. We do two dives. 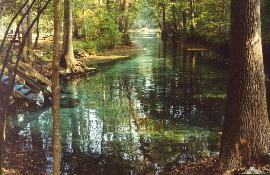 First is the main Ginnie Springs (sometimes known as the "Ballroom") cavern dive (photo of main boil at left). I am surprised at the size of the limestone cavern/room, the amount of overhead that you find after you swim into the cavern opening, and the maximum depth of the cavern (60 feet). A metal grate blocks access to a tunnel. The tunnel gushes a strong current of spring water. The cavern is large enough to afford a fair amount of interesting exploration of fossils and limestone formations (our dive is about 35 minutes). It is about 60 feet wide and 70 feet long, and slopes downward from 30 to 60 feet. The view of the mouth/entrance from the bottom of the cavern, is, like Paradise Springs, rather impressive. A bright blue is seen through the crevasse and crystal clear water. 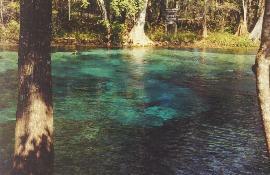 In fact, the water is so clear at Ginnie Springs that Jacques Cousteau once observed that Ginnie has the clearest water he has ever seen, stating that at Ginnie, there is "visibility forever." Our second dive is just a short distance from the Cavern. We do a series of 3 holes (or pools) strung together by a short spring run (photo at right). The first is called "Little Devil Spring," which is a large crevasse. We swim down to the bottom of the crevasse to a depth of 40 feet. Next, we swim downstream to "Devil's Eye," which is a round chimney feature that contains a tunnel at the bottom which connects to a third pool downstream (divers must be cave certified to do the tunnel, and no lights are allowed for non-cave certified divers in any of the Devil's dives). We sat and rested at the bottom (about 30 feet deep), which contains a thick layer of sea shells. Our final destination is "Devil's Ear," another large crevasse which is the other end of the tunnel from Devil's Eye. The bottom of the crevasse takes you down to about 40 feet. Much of the Devil's dive is rather shallow, so with a single tank, we are easily able to do the full down-and-back dive along the spring run, including an unhurried look at each of the three Devil "body parts" with plenty of air left our tank. Dive time was about 50 minutes to an hour.